If you are tired of looking at swirls even after polishing it's time to step up and grab the premium rotary buffer on the market. The Makita 9237C-X3 is an outstanding buffer that has the power to remove very deep imperfections in your paint or jewel your paint to a new level of gloss and depth. Orbital and dual action buffers don't have nearly the power this buffer has to really work in a polish and get the absolute maximum cutting power and best possible finish. With the Makita 9237C-X3 you can work in a polish significantly faster while achieving better results than an orbital or DA buffer. This is possible because it's a rotary buffer that spins continuously in one direction instead of just oscillating. With any rotary buffer you should do some research on how to properly operate a rotary and put in some time practicing at low speeds before performing your first detail. With a skilled operator, you can completely restore the oldest and most faded clear coats to look like new! The Makita 9237C-X3 comes with several extras that help add even more value to this purchase. It comes with the Makita 9237C-X3 which is a complete buffer with the 6.5" hook and loop backing plate included. This backing plate allows you to easily swap on and off other 6.5" pads or larger pads. 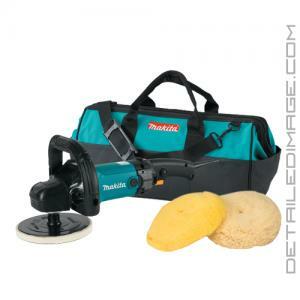 It also includes the Wool Compound Pad and a Blended Polishing Pad. These specific pads are very aggressive cutting pads so we recommend you also get some of the Lake Country foam polishing pads. It comes with a hex wrench as well that allows you to change out the two handles. You can also purchase separately the 3.5" Lake Country Hook and Loop Backing Plate with the 4" Lake Country Polishing Pads. The 4" pads are a little easier and safer to use because they have less cutting power compared to the larger pads. The matching carrying case is very convenient and that allows you keep all your products in one bag specifically designed for this unit. A large part of the reason this buffer is so highly regarded is because each part of it was built to achieve the best results possible and last for years and years! This buffer has a 10 amp motor that will not bog down, so it delivers smooth and reliable power no matter the task. It's even powerful enough to use for really tough grinding tasks if desired. It weighs 6.6lbs so it's pretty light and easy to maneuver for just about anyone. It comes with a side handle and a hoop handle that makes it very easy to control and operate for you at virtually every panel during the process. To adjust the speed we recommend you set the speed dial (1 - 6) to the desired speed (see chart below). If you set the speed to 2 then the buffer will not go above 900 RPMs. However there is a variable speed trigger, which you squeeze to turn the buffer on and start spinning. If you squeeze this trigger lightly it will start off at a lower speed and if you squeeze it all the way it will reach 900 RPMs. It also has switch that allows you to lock in the trigger so you don't have to worry about holding the it at one constant speed. This feature allows you to keep your hand off the trigger and remain focused on working in the product. The Makita 9237C-X3 is a very powerful rotary buffer that can go from 600 - 3000 RPMs. Many other buffers start off between 900 - 1200 RPMs which can be difficult to use for new rotary users. However, this unit can start at 600 RPMs which makes learning how to use it much easier and safer. At the top speed (3000 RPMs) it has far more power than you will ever need while detailing. With this perfect range, detailers can operate this unit safely and it has all the power you will ever need when you master the unit. Use this buffer in combination with a quality buffing pad and polish and you will be amazed at how easy it is to restore your paint like new. Permanently remove those swirls and get the best shine possible with the Makita 9237C-X3. Stop worrying about what if and purchase this buffer today, we promise you'll absolutely love it! The Makita 9237C-X3 is the same buffer as the popular Makita 9227C-X3, with an improved cord guard for increased flexibility and longer life! I used it the first time on my boat and I can almost shave with the mirror like finish it produced. I'm 68 years yound and it didn't wear me out. Coming from a random orbital, I thought polishing cars was all about hacking away and being exhausted just to achieve mediocre results. That was before I got my hands on the 9227C. The Makita does in one pass what would normally take two or three passes. Not only that but the clarity and depth in the paint is so superior, the difference can be seen in low light. In the sun, cars look better than new. I love the option of picking between two handles and the gentle start feature on the trigger. With enough practice, you can even spool up the speed on the dial smoothly and linearly. The machine is heavier than most random orbitals but it feels like a quality buffer and is very well put-together. Finally, even on notch 3, this Makita is very quiet in its operation and is probably the quietest buffer I've ever used. The learning curve is about the only downsize I can identify with this machine but that holds true for all rotary buffers. I strongly suggest getting a bit of practice with it before going to work on a customer car but once you get the feel of it, you won't regret buying this machine. I guarantee it is worth every penny. finally DI has gotten the makita into their inventory. unfortunately for me when i bought mine they did not so i had to resort to other company's that took much longer to ship it out. onto the review, i dont like the stock backing plate at all, get the 3m, meguires, gloss it, or lake county plates before you place your order. unlike many other buffers that go straight to speed, the makita has the slow start feature that helps to minimize product sling and makes it easier to control right off the bat. this buffer is HEAVY. if you are transitioning from a metabo or a porter-cable prepare for a workout. after a few days of use it will feel natural.all in all it is a great buffer, easy to access controls, trigger lock, and a very well balenced machine that will take out any defect you can come across!